Traditional Medicinals Organic Nighty Night Tea 20 Tea Bags is one of the many medicinal teas ChelseaMarket.ca offers. Take a look at other herbal and medicinal teas. Do not use if you are pregnant or breastfeeding. Do not use if you are allergic to the Asteraceae/Compositae (daisy) family. Traditional Medicinals offers Herbal Dietary Supplements, Natural Health Products, OTC Medicines and Traditional Herbal Medicinal Products for the global market. The beauty and mystery of Nature continues to capture Traditional Medicinal’s imagination and reverence. For more than thirty years, they have been exploring the plant world, providing you with reliable teas and other herbal products formulated with the knowledge of Traditional Herbal Medicine and the most modern scientific methods of quality assurance. Recognizing that all things are connected, Traditional Medicinals is guided by a deep respect for the earth, striving always to ensure that their actions reflect their commitment to the environment. Traditional Medicinals is committed to providing affordable traditional herbal medicine for family health and welfare. They embrace sustainability, ingredient purity, social and environmental activism. Knowledge – They believe in the healing power of plants and the wisdom contained within the world’s systems of Traditional Herbal Medicine. Their team of herbal experts bring a wealth of ancient and modern knowledge to the creation of our products. Efficacy – Their products work. No other North American herb company invests in the systems, research, testing and quality medicinal grade herbs the way they do at Traditional Medicinals. Sustainability – Traditional Medicinals believes in living as if there is a tomorrow and their business practices reflect this concern for the future. They mean it when they say they care about protecting the earth. Whether it’s purchasing wind energy or installing solar panels for our electricity needs or using organically grown herbs, they go further to preserve the environments and communities on which we depend. Partnership – They believe in equitable relationships with their customers, employees, farmers and our community. Traditional Medicinals believes that a product that’s good for your body should be good for everybody. In early 1974, three young friends started Traditional Medicinals in the back store room of a small herb shop along the Russian River in Northern California. The company was founded with the intention of providing herbal teas for self care, while preserving the knowledge and herbal formulas of Traditional Herbal Medicine (THM). At the time, traditional herbal tea infusions had all but faded away in the United States. And never before had these reliable formulas been available in convenient tea bags. Over the decades that followed, the company introduced millions of health conscious consumers to traditional herbal tea formulas and the concepts of THM. These reliable natural teas were well received and Traditional Medicinals has grown dramatically. 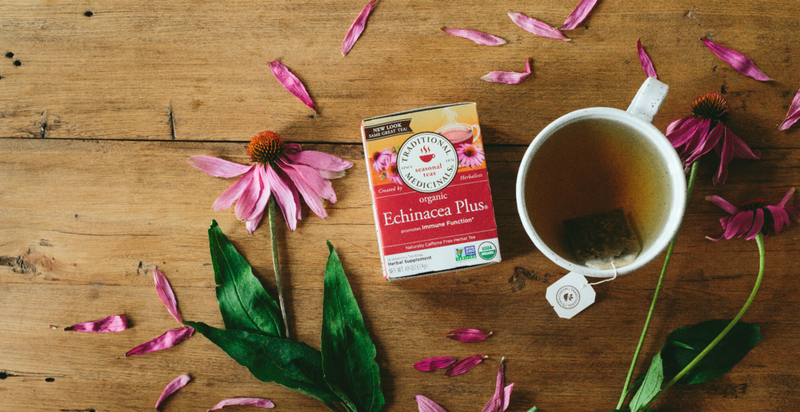 Well over a billion cups of tea have been produced at their beautiful country facility and some products like Organic Smooth Move, Organic Throat Coat and Organic Echinacea Plus have become mainstream and can be found in supermarkets and drug stores throughout North America. Additionally, their product offerings have expanded to include some of their best selling tea formulas in other forms such as pastilles, syrups, powders and capsules. From their simple beginnings, Traditional Medicinals have been able to share the wonder of herbs and pass along the knowledge contained in the great systems of Traditional Herbal Medicine. To this they have added clinical testing and scientific understanding, as well as sophisticated processes to ensure you reliable products. So, while their business has grown and evolved, they remain rooted in the serious and spirited commitment with which they began over thirty years ago. Enjoy 3 cups daily. Especially good with honey. Why is tea a good delivery system? Herbal preparations must be absorbed efficiently by the body. Sufficient evidence exists demonstrating that Traditional Herbal Medicine (THM) in a liquid form (fluid extracts, tea decoctions or infusions, syrups, tinctures) are more readily absorbed into the system than if they are dried for use in a solid-dosage form (capsules and tablets). A tea infusion allows the natural interactions between the various components in the herbs to occur. Water is an inexpensive, pure and readily available extraction solvent, is non-toxic and has a wide range of solvent actions. Most of the major compound groups occurring in plants are either soluble in boiling water or will release into the water in time, due to the interactions occurring during the water extraction process. A tea also allows you to experience the “true taste of herbs”. Taste is considered to be a vital component of herbal formulas, a component mostly absent in solid dosage form products with the exception of lozenges or pastilles. Certain tastes trigger specific physiological responses. For example, bitter tastes stimulate the taste buds, causing a secretion of saliva and gastric juices, stimulating digestion. If you cannot taste the bitter element, the digestive stimulation will not occur. What conditions are herbal teas helpful for? The extraction of herbs with hot water (making tea) is an ancient tradition. 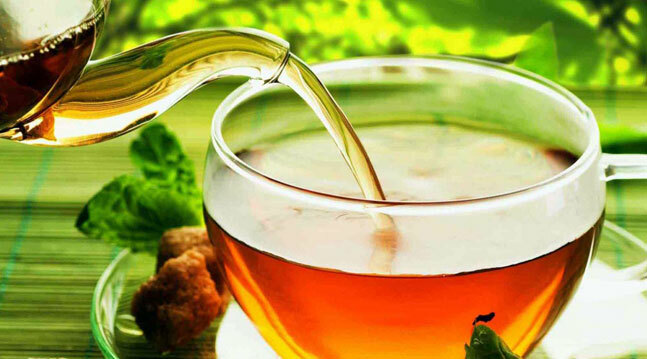 Teas have a long history of use in many systems of Traditional Herbal Medicine worldwide. Historically, teas have been one of the most commonly used delivery systems for natural health products. Teas are made from one or more herbs and are generally prepared by the consumer using the infusion method (by pouring boiling water over the herbs and steeping in a covered cup, usually for at least 10 minutes), which is the most convenient method of preparation. There are two basic types of tea bags, the glued pillow bag and the stapled flow-through, double-pouch filter bag. Using the double-pouch bag results in a more efficient extraction of the herb’s beneficial components because it allows greater “surface area” access for the boiled water to reach. For a tea to maintain its quality and remain reliable until the expiration date, it is essential that each tea bag is sealed in an “overwrap” that provides an oxygen and moisture barrier. Exposure to air, light and humidity has a measurable negative impact on the quality of cut herbs. 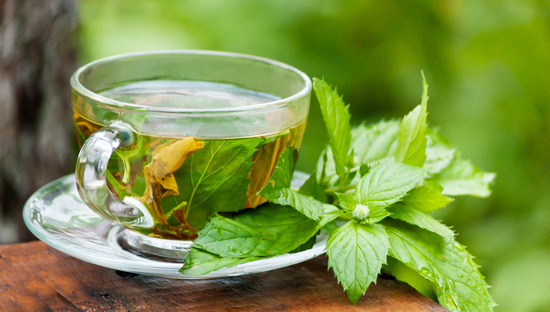 Herbal teas that are not tightly sealed will rapidly lose their strength during storage. Why is a long steeping time important? In comparison to beverage teas, which generally require only a 3-5 minute steep for taste considerations, Traditional Medicinals’ recommendation of a 10-15 minute steep may seem long. However, steeping times for Traditional Herbal Medicines (THMs) in tea infusion form are generally set at anywhere between 10 and 30 minutes depending on the herbs in the formula. Some teas are best decocted (simmered) for 30 minutes or longer. A longer steeping time allows for more of the components in the herbs to dissolve into the tea water. Leadership at Traditional Medicinals tends to think that water is the extraction solvent when they prepare a cup of tea – pour boiling water over the herbs, let them brew a few minutes and then strain and drink. But there’s more depth to this water story! While the initial solvent is the boiling water, as soon as the plant’s cell walls begin to break down and compounds enter the water, the water changes. It isn’t just water anymore. Depending upon what compounds are first released, the water can become a mild acid or a mild base solution, which in turn affects the release of other compounds. The longer that you let the herbs steep, the more components that you will have in your teacup. Each new compound that is released changes the solvent’s composition until full saturation occurs or until the reaction is stopped by removing the herbs from the solvent. This enables some compounds that are not entirely water-soluble to still be released into the water. This is why a sufficient steeping period is necessary to produce a complete, balanced extraction. For instance, flavonoids are a group of plant chemicals that are only slightly soluble in water. But testing shows that there are therapeutic levels of flavonoids in a properly brewed cup of tea prepared from flavonoid-containing herbs. Another example is caffeine in black and green teas. The central nervous system stimulant effect of caffeine is strongest when the tea is steeped only 2-5 minutes, because caffeine dissolves quickly into hot water. Longer steeping times of 10-20 minutes will increase the yield of catechin polyphenols, which decreases the stimulant effect, because the catechins bind the caffeine. What are pharmacopoeial grade herbs and why use them? Traditional Medicinals’ herbal products are formulated in accordance with specific rules of combining and compatability stemming from traditional systems of herbal practice. There are several grades of herbs available, including pharmacopoeial grade, food grade and inferior grades. They follow standards for pharmacopoeial herbs such as those published in the European Pharmacopoeia, which ensures that their teas and other herbal products meet the highest quality standards. Pharmacopoeial grade herbs cost more than the commonly used commercial grade herbs, but they think that you’re worth it. Are Traditional Medicinals products organic? Traditional Medicinals have been committed to organic agriculture for over three decades. Back then they believed that the herbs in our teas should be grown without the use of harmful fertilizers and pesticides. Now with the USDA National Organic Program, what was once on the fringe has become mainstream. Traditional Medicinals continues to recognize the importance of sustainable agriculture and wild collection, working to develop new organic sources of herbs for all of our products. They believe teas that are good for your body should be good for the earth as well. Are Traditional Medicinals’ products suitable for vegetarians and vegans? The ingredients of Traditional Medicinals herbal capsules, powders and teas are natural and plant-based (no synthetic, petroleum-based, or animal-derived components) and are suitable for use by vegetarians and vegans. Traditional Medicinals herbal pastilles and syrups are suitable for vegetarians but not for vegans. The pastilles contain beeswax and honey and the syrups contain honey. Do any of Traditional Medicinals’ products contain caffeine? Yes. Some of their products include caffeine-containing herbs such as maté leaf (Ilex paraguariensis) or black or green tea leaf (Camellia sinensis). Are Traditional Medicinals green teas tested for fluoride content? Yes. Traditional Medicinals has had their organic green tea products tested for fluoride at an independent laboratory and the test results have shown none detected. There is concern because some green teas have been shown to contain relatively high levels of fluoride. Fluoride-containing drinking water is considered to be a risk factor for dental fluorosis, a condition caused by an excessive intake of fluorides (2 or more ppm in drinking water). Some plants, including the tea plant (Camellia sinensis), are inherently able to uptake and accumulate relatively high quantities of fluoride. The soil and water conditions where the tea plant is grown, as well as the methods of cultivation, are factors that can determine fluoride levels in the tea leaf. Some studies have also shown a correlation between lower quality teas having higher fluoride content and higher quality teas having lower fluoride content. Do any Traditional Medicinals products contain genetically engineered components? No. Traditional Medicinals do not use ingredients that were produced using biotechnology in their products or at any stage of production, processing or handling. Following a precautionary principle, they believe that the practice of genetic engineering should be halted and in the meantime all products containing genetically engineered ingredients should be clearly labeled as such. Traditional Medicinals is opposed to the practice of genetic engineering, which involves the insertion of genes from any source (including bacteria, other plants or even animals) into the DNA of cultivated plants. Genetically engineered crops, altered to be insect resistant, may throw off the balance of nature and cause harm to beneficial insects such as ladybugs, butterflies and other pollinators. They believe that the potential long-term risks to the environment and to human health far outweigh any perceived benefits that could come as a result of manipulating nature in this way. They also see the spread of genetically engineered crops as a serious threat to certified organic and/or biodynamic agriculture due to the inability to control cross-pollination. Many pollinators travel long distances that may put them in direct contact with both certified organic acreage and genetically engineered acreage. Forty-six of their 47 herbal teas do not contain measurable gluten. Traditional Medicinals tea bags (made from Manila hemp, extracted from the leaves of abaca, a relative of the banana tree family) and their strings (cotton) also do not contain gluten. Two of the herbs they use may contain gluten. PMS Tea, contains barley, which naturally contains more than 20 parts per million (ppm) gluten. St. John’s Good Mood contains oatstraw, but does not contain measurable gluten (detection limit 3.00 ppm) and can be labeled as gluten-free. If the use of an ingredient results in the presence of 20 ppm or more gluten in a food or dietary supplement product (i.e., 20 micrograms or more gluten per gram of food), then it cannot be labeled as gluten-free. Traditional Medicinals pastilles are labeled as gluten-free. As a flavor component, their Throat Coat Herbal Pastilles contain a small amount of organic maltose syrup, which is made from wheat starch. The proteins, however, are removed in the process of making wheat starch which makes it a gluten-free ingredient. Wheat starch generally contains not more than 0.3% of total protein. The analysis of the maltose syrup used in their pastilles product shows that it contains 0.1% proteins. If you are a celiac patient who responds to extremely low doses of gluten, you should avoid Throat Coat Herbal Pastilles. No. Traditional Medicinals does not add flavors to their products. While it is common for beverage teas to contain added flavors, teas for self care generally do not. They prefer to balance an herbal formula’s taste profile using other complementary herbs or their essential oils, because it is important to experience the true taste of the herbs for best results. Licorice root is one of the most widely used medicinal herbs today and has been employed therapeutically for several thousand years in western and eastern systems of Traditional Herbal Medicine. It is also one of the most widely used herbs in many Traditional Medicinals’ herbal formulas. Management is occasionally asked about its safety and about some reports that it may contribute to potassium loss and raising of blood pressure. According to the World Health Organization (WHO) licorice monograph, no adverse effects have been associated with licorice root when it is used within normal therapeutic dosage and treatment period limits. On prolonged use (longer than 6 weeks regular daily ingestion) at overdose levels (greater than 50,000 mg daily), sodium and water retention and potassium loss may occur, accompanied by hypertension, edema, hypokalemia, and, in rare cases, myoglobinuria. Licorice adverse events have generally been associated with the overdose or binge eating of licorice candies, which may contain concentrated extracts of licorice root. 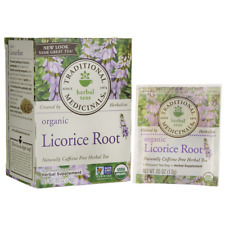 According to the Food and Drug Administration (FDA), licorice root is affirmed as Generally Recognized as Safe (GRAS) for use, among other things, as a flavoring agent or flavor enhancer in candies, foods, dietary supplements as well as nonalcoholic beverages including herbal teas. In a clinical study involving their Throat Coat herbal tea, which contains both licorice root and licorice extract as primary ingredients, there were no significant changes in systolic or diastolic blood pressure measured during the course of the study with patients drinking 4-6 cups of tea daily. 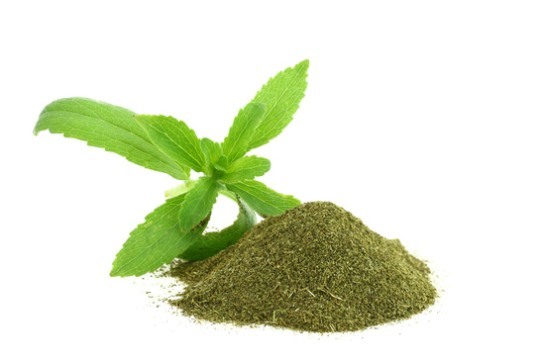 Stevia leaf (Stevia rebaudiana) is used in some of Traditional formulas at very low levels functioning appropriately as a taste balancing component. The American Herbal Products Association (AHPA) Botanical Safety Handbook gives stevia leaf a ‘Class 1′ safety rating, meaning that it can be safely consumed when used appropriately, and it has no known contraindications or specific use restrictions. Traditionally, stevia leaf is used as an herbal tea by indigenous peoples of South America including the Guaraní and Mestizos, often in combination with maté leaf (Ilex paraguariensis). Traditional Medicinals puts a three-year shelf life from the date of manufacture on their tea boxes. The left side panel of the box states “Best if Used By – Expiration Date/Lot” and these series of letters and numbers indicate the expiration date. I.E. if your carton reads APR11 R 2020 this indicates that the tea is fresh through April 2020. (The R 2020 is the lot number). Traditional Medicinals tea cartons are printed on 100% recycled paperboard (at least 55% verified post-consumer waste). We strongly encourage recycling. When finished, please flatten the carton and include it with other household paper or cardboard for recycling. Why are all Traditional Medicinals tea bags individually wrapped and sealed? Traditional Medicinals pack each tea bag into a tamper-evident, oxygen and moisture barrier sealed overwrap, which prevents deterioration of components and is essential for preserving the stability of herbal ingredients. Exposure to air, light and humidity has a measurable negative impact on the quality of cut, dried herbs. The sealed teabag overwrap assures that the potency of the herbs remains intact until they reach the teacup, which is an important consideration when using teas for self care. Their teas are made with pharmacopoeial quality herbs and it is essential to protect their potency. Once herbs are cut and dried, their quality diminishes considerably if not stored and sealed properly. The overwrap is not excessive packaging for a pharmacopoeial quality herbal tea but rather an absolute requirement for shelf life stability – they want to make sure the tea will be reliable. There was a time when all agriculture was “organic.” It is only recently in the history of agriculture that people have begun to use synthetic chemicals and fertilizers. However, the use of agricultural chemicals is now widespread and poses significant hazards to the environment and to people. In fact, these “non-organic” practices are so widespread that organic is still considered outside of the mainstream. Although the rise in popularity of organic goods is fast changing this, there’s still a long way to go until the norm for agriculture and processing is organic. According to the National Organic Standards Board (NOSB), “Organic agriculture is an ecological production management system that promotes and enhances biodiversity, biological cycles and soil biological activity. It is based on minimal use of off farm inputs and on management practices that restore, maintain and enhance ecological harmony.” Some synthetic substances are allowed in organic crop production, if they are on the approved list, if they are used according to the National Organic Program (NOP) and if the use of such substances does not contribute to contamination of crops, soil or water. Today, the practices of organic agriculture and, secondarily, organic processing methods, have been standardized and are regulated by the United States Department of Agriculture (USDA). This standardization is good news for consumers, who can now be assured that when a product says it is organic, a reliable set of practices and procedures have been used. The USDA issued the rules of the NOP in 2002. Any product using the word “organic” must follow the regulations of the NOP. These rules include everything from the use of permissible ingredients to growing methods to manufacturer handling regulations. All of this is done to ensure that organic means the same thing everywhere it is used. Read the NOP to learn about specific organic guidelines for growers and manufacturers. Traditional Medicinals organic products follow the NOP regulations. Traditional Medicinals is certified by the California Certified Organic Farmers (CCOF), which has been, and continues to be, one of the leading organic certifying agencies. Why is Organic Agriculture Important? At this time, it is nearly impossible to go anywhere in the world and not discover toxic chemical residues in the soil, water, animal and plant life. Chemicals are taken up through the soil and water into plants and animals and even people. The widespread use of chemicals in agriculture and manufacturing has had unforeseen consequences. Adhering to organic methods helps to restore an area by freeing it from the application of potentially hazardous chemicals. Organic farms are also habitats for wildlife and insects, which are important to ecological balance. Soil quality is often enhanced and restored. The people who work on organic farms are not exposed to potentially dangerous levels of chemicals. The groundwater is not polluted with the run-off from these chemicals. Organic methods respect life and the delicate balance of ecological systems. Over the last 30 years, the awareness of and demand for organically-produced products has resulted in a tremendous rise in the number of organic acres under cultivation around the world. But not nearly enough! Traditional Medicinals wants to see the day when organic is the rule, not the exception, so they continue to work with growers around the world to develop new sources of organic herbs. In order to carry the USDA Organic Seal, they must strictly adhere to the NOP regulations established by the USDA. Traditional Medicinals is certified by the California Certified Organic Farmers (CCOF). These rules include not only rigorous standards regarding growing methods, they also regulate how organic products are handled, stored, tracked and processed. Every organic manufacturer maintains an audit trail that leads from their final product all the way back to the land that the ingredients were grown on. Only certain materials can be used, not only in growing and processing, but also in the manufacturing facilities themselves. Traditional Herbal Medicine (THM) is a practice of protecting and restoring health that existed before the relatively recent arrival of modern medicine. THM often serves as one component of a comprehensive system of medicine that may involve the use of plant, animal and mineral based medicines, spiritual therapies, regulation of diet and exercise, and manual techniques (like acupuncture or massage) to maintain health but also to prevent and treat illnesses. According to the World Health Organization (WHO), up to 80% of people living in developing countries still rely primarily on Traditional Medicine for their healthcare. The use of THM in industrialized countries is also spreading rapidly, where THMs are often referred to as alternative medicines or complementary medicines or even as herbal dietary supplements or natural health products. Systems of THM that are widely used in national healthcare systems around the world include: Traditional Ayurvedic Medicine, Traditional Chinese Medicine, Traditional Unani Medicine, and Traditional Western Herbal Medicine. Others include Traditional Japanese Kampo Medicine and Traditional Tibetan Buddhist Medicine. While many of these systems of medicine are taught in medical schools with a well-defined written herbal materia medica and formulary, there are also non-written systems of THM that are passed on through the oral tradition, such as the Traditional Native American Medicine of various tribes throughout North and South America, and other Shamanic healing systems that involve the use of medicinal plants. All things are interdependent; our health and well being rely on the health and well being of the planet. Good stewardship of the earth’s precious natural resources, both human and natural, is a cornerstone of Traditional Medicinals business philosophy. They want to leave a legacy of preservation and sustainability for generations to come. Whether it’s Traditional Medicinal’s commitment to using organic herbs, off-setting their electricity use with solar and wind power, utilizing recycled paper in their packaging or seeking out partnerships for sustainable herb sources, they go to great lengths to bring you reliable herbal products. While the growth of awareness in natural healthcare has resulted in a huge expansion of the availability of herbal products, it has also sadly contributed to non-sustainable methods for the harvest of certain herbs compounded by the increasing loss of habitat due to encroachment from development. Because of this, Traditional Medicinals ingredient philosophy mandates that they take into consideration the environmental and social issues associated with a particular herb. Traditional Medicinals supports sustainable wild collection practices and work with their herb suppliers to implement sustainable methods for all wild herbs. Traditional Medicinals and their products are based on the principles of Knowledge, Efficacy, Sustainability and Partnership. Every herbal product they make is designed to serve a specific purpose. As such, they are formulated according to well-defined systems of Traditional Herbal Medicine that guide the appropriate combining of herbs. They won’t make products using just any herbs. Every tea and herbal product that they make must have sufficient evidence of safety, quality and efficacy in support of Traditional Medicinals claim statements and formulation rationale. Traditional Medicinals’ products are created for self-care of common, non-serious conditions. Every choice makes a difference. Traditional Medicinals has been thinking a lot about their choices for more than thirty years. Their low impact packaging and recycling plan helps them leave a lighter footprint for all of us here today – and tomorrow. For twelve consecutive years, Traditional Medicinals has received the Waste Reduction Awards Program (WRAP) award, recognized for their outstanding efforts to reduce waste! 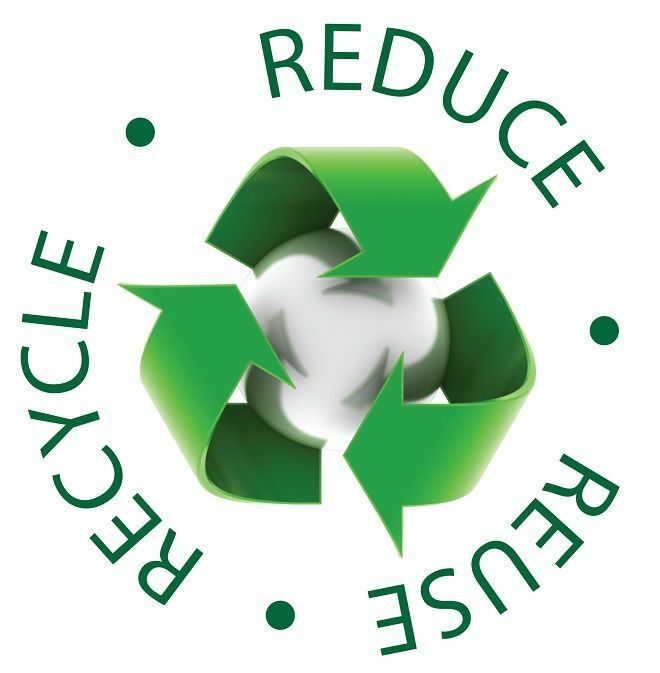 Each employee has an individual recycling container to make it easy to recycle paper, plastic, glass, metal and anything else they can. Paper is one of the largest sources of waste from businesses, so in addition to recycling, they constantly seek ways to minimize their office paper use. Their tea cartons are made from recycled paper board (at least 55% verified post-consumer waste) and shipped in recyclable shipping cases. They use tea bags made from unbleached manila hemp (Musa textilis) pulp attached to a cotton (Gossypium spp.) string. You can compost your used tea bags, string and all, rather than throwing them in the trash. They will make great soil later on! You can also help support their efforts by easily recycling your empty Traditional Medicinals tea boxes – check with your local trash service to determine whether they pick up recycling or not. Check out the recycling informaton messages on all of their tea cartons, they print useful tips on the inside of every box.